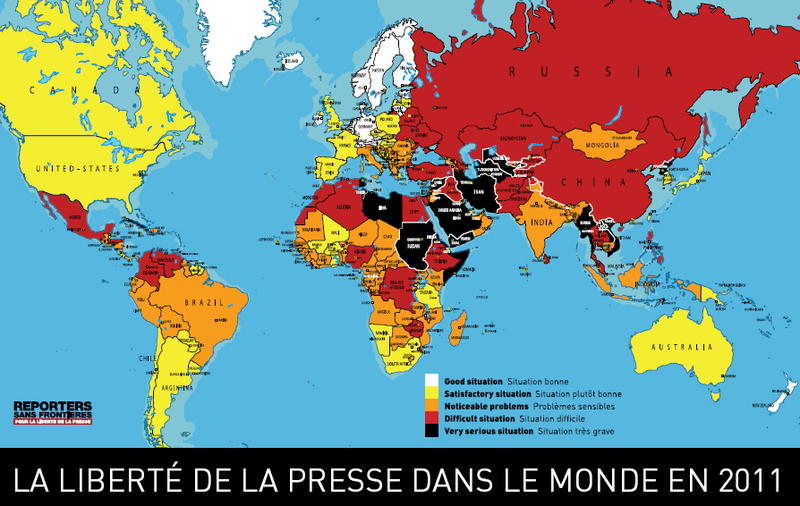 According to Reporters sans frontières (Reporters Without Borders), a France-based non-governmental organization, latest Press Freedom Index (covering the period between 1 September 2009 and 1 September 2010), Iran ranks 175, with 178 countries assessed. Only Turkmenistan, North Korea and Eritrea rank lower. The brutal crackdown of press, media in general, the internet, even mobile phones after last year’s disputed re-election of president Ahmadinejad has led to a further crash of Iran’s already embarrassing score. Under these circumstances, does anybody believe that a poll on overall (dis-)satisfaction of the Iranian populace after the election, which had been organized by the University of Tehran and which has been published by WorldPublicOpinion.org in February 10, 2010, has any meaning? Update October 21, 2010. Israel’s ranks (86, 132 in occupied territories) are not less embarrassing. It joins other countries in the Middle East, for instance the UAE and Kuwait (both 87), Jordan (120), Qatar (121), Oman (124), Bahrain (144) and, worst of all, Saudi Arabia (157). All are strong allies of the West. Last update October 21, 2010. This entry was posted in Iran and tagged crack down, dictatorship, freedom of press, Mahmoud Ahmadinejad, opinion polls, presidential election, Tehran University, WorlPublicOpinion. Bookmark the permalink.